Deportation is a hardship that can cause strain for not just the deported person, but their family and friends as well. If you know someone who has been removed from the U.S., it’s understandable that you want to find a way to help them return as soon as possible — and to do so legally, so they aren’t deported again. Here are the basics of returning to the U.S. after deportation. The good news is, yes! Most of the time, someone who has been deported may return to the U.S. However, the downside is they may not be able to return in the near future. Figuring out those restrictions will depend on the individual’s specific circumstances. First, the ability to return will depend on where the person is in the deportation process. If it’s still early in the process — they have received a Notice to Appear but haven’t gone before an Immigration Judge yet — there is still time to find an immigration lawyer and attempt to prevent the deportation from going through. You can see more about how that process works in our previous blog. However, if an Order of Removal has been issued, the steps are going to be different. If a deportation order or Order of Removal has been issued, returning to the U.S. comes with additional rules. First, there will be a set amount of time a person has to wait before they can return. There are five-, ten-, and 20-year bans depending on the circumstances of removal. There is also the possibility of being permanently banned from the country, but that is typically placed on those who have committed an aggravated felony, or who have tried to enter the country without permission multiple times. 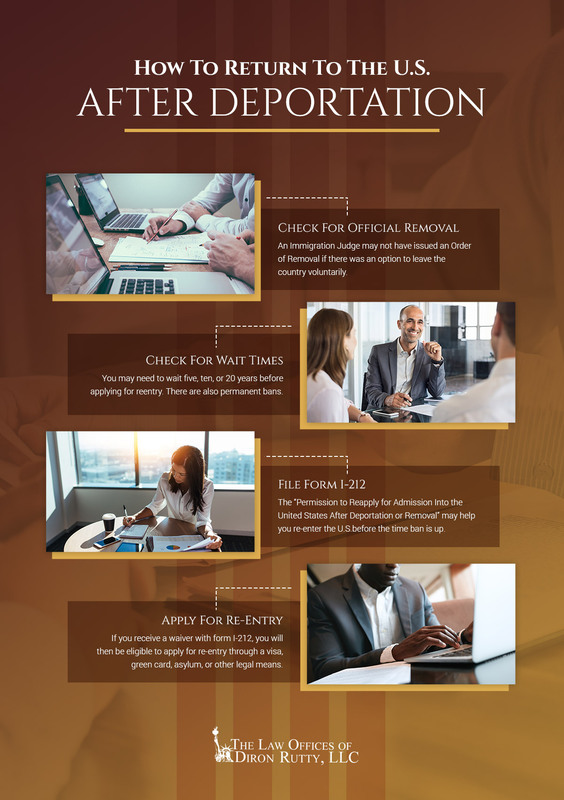 The first option is to find out what the length of time is on the ban, wait it out, and apply for an immigrant visa or green card after the necessary time has elapsed. For someone with a ten- or 20-year ban, however, that’s a long time to go without seeing family and friends in the U.S. The other option is to apply for permission to reapply for admission — essentially, an application that would waive the removal order and allow that person to apply for legal entry into the country. Form I-212, the application for “Permission to Reapply for Admission Into the United States After Deportation or Removal,” isn’t an application for reentry. It simply gives permission to apply for a visa or green card. However, this application can allow you to then apply for an H-1B work visa, asylum, or other means of legal entry into the U.S. However, if you are potentially inadmissible for reasons other than an Order of Removal, you may still need to file the appropriate information to overcome those hurdles. No matter where you are in the immigration or deportation process, you don’t have to wade through everything on your own. 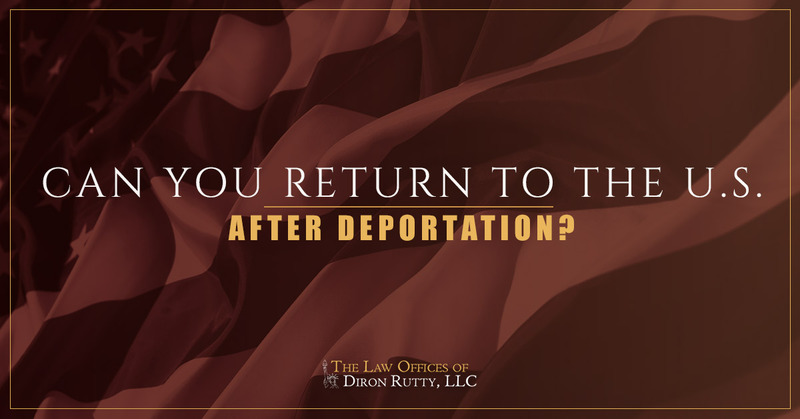 Connect with an immigration lawyer at the Law Office of Diron Rutty, LLC in the Bronx for experienced, compassionate help navigating immigration in New York City.